The search for inspiration is one that all artists must undertake. Often the inspiration comes from a source of beauty or passion, yet in the ever-developing world such notions can become subsumed beneath the financially-driven cynical lifestyles that people seemingly strive to achieve. This quandary is a frustration for Yang Mi-ja (Yoon Jung-hee (윤정희) as she struggles to find illumination for her poetry class. 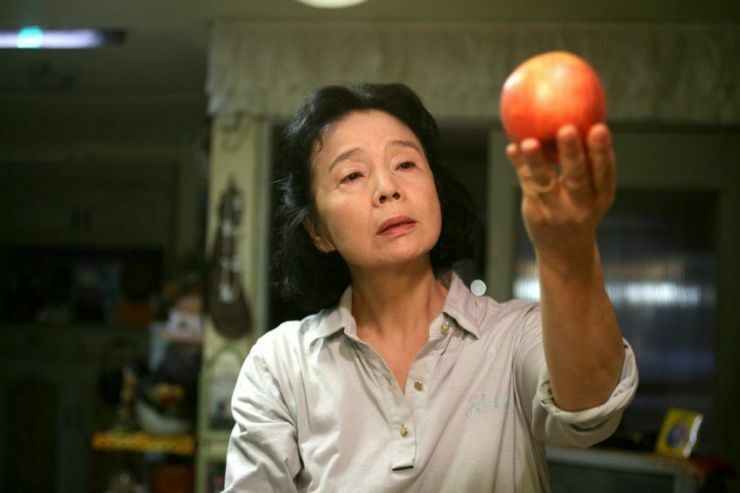 As a grandmother searching for beauty, Yoon Jung-hee gives an astonishing critically acclaimed performance that earned the Best Actress award at The 2010 Daejong Film Awards and The 37th Annual Los Angeles Film Critics Association. Her performance, as well as the wonderfully understated script and direction by auteur Lee Chang-dong, makes Poetry (시) one of the most delicately – even ‘poetically’ – constructed, character driven pieces of realist cinema of the year, and is an incredible achievement. Poetry tells the story of Yang Mi-ja (Yoon Jung-hee (윤정희), a grandmother who scrapes by working as a part-time care worker and claiming social benefits. Mi-ja has a slightly eccentric and cheerful disposition, and has the ‘veins of a poet’ according to her daughter. Seeing an advert for a poetry class at her local cultural center, Mi-ja jumps at the chance to express herself through the art form. However, despite all her attempts, she is unable to begin writing. This is compounded further as Mi-ja visits the hospital and discovers she has Alzheimer’s disease. With dementia setting in, she finds that writing becomes even more frustrating as simple words begin to elude her. Furthermore, Mi-ja is the guardian of her grandson Jong Wook (Lee David (이다윗), who has little tolerance and even less respect for her. Upon discovering that Wook has been involved in a serious crime, Mi-ja must endeavour to resolve the conflicts within her life and unveil an inspirational beauty in order to write her first poem. Poetry begins (and ends) with the gentle flowing of water, which is a perfect allegory of how the narrative is presented. The gentle ‘flow’ of the narrative is expertly conveyed by director Lee Chang-dong, who never emphasizes plot points but merely allows them to subtly enter the life of his central protagonist, such as when the body of a young girl is slowly and delicately washed ashore to become a defining event. The decision to use hand-held techniques, while adding to the realism, is also similar in nature to the movement of the water and on occasion appears voyeuristic, as if the camera itself is the spirit of the young girl watching Mi-ja. Through Mi-ja, Lee Chang-dong explores a variety of societal and cultural issues that enter her world, though never in a confrontational manner and all while she strives to find inspirational beauty. For example, at Mi-ja’s poetry class the students share their experiences of a moment of happiness. Each tale is simultaneously sorrowful and poignant, such as finding love in an extra-marital affair, highlighting the differences between social expectation and reality. For Mi-ja, her diagnosis as an Alzheimer’s patient is blunt and borders on rude, while it’s entirely possible the appointment was forgotten shortly after leaving the hospital. Mi-ja’s part-time job as a carer is also illuminating in portraying the plight of the disabled and lonely. But by far the most pressing concern for Lee Chang-dong is the nature of crime and punishment expressed through Mi-ja’s grandson. Wook – and his friends – have committed a crime, and as with the other events in Poetry, there is no revelation in regards to this new information. Instead, the father’s of all involved invite Mi-ja to meet for lunch in order to discuss a settlement so that charges are never filed against their children. Again, director Lee Chang-dong subtly enters this event within the narrative, but the nature of the crime is so serious, that the objective way in which the conversation transpires and lack of any emotional display emphasises the abhorrent and selfish nature of all involved. 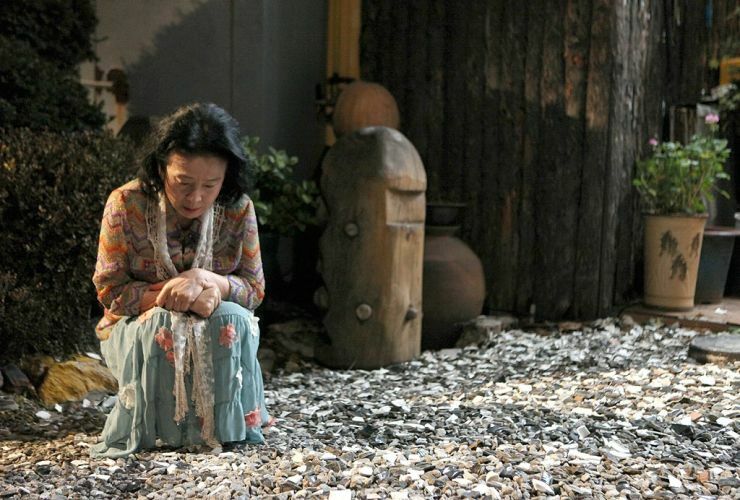 The notion of such settlement is common practice in Korean culture, and Lee Chang-dong expresses his disgust for it through Mi-ja as she silently stands and exits the room. Compounding the act further is that the young criminals have no remorse. Everyone continues as if nothing has happened. Mi-ja however is weighed down by the issue, internalizing her frustrations while continuing on her quest to understand beauty in a world she sees precious little of. Yoon Jung-hee is truly wonderful as Mi-ja. She conveys the subtle elegance of a woman striving to achieve something noteworthy in her life, but being coerced into events beyond her control that halt her from doing so. Jung-hee’s strength, eccentricity, resilience and ambition are poignantly conveyed by the veteran actress who fully deserves her accolades. Mi-ja is a woman of modest means, yet is inspirational to those around her in attempting to articulate beauty within a poem. Her decisions that lead to the discovery of her subject are incredibly poignant, and her understanding of the beauty within inspires her to write a heart-wrenchingly beautiful and eloquent poem that lingers long after it has been recited. Poetry is an incredible film. The script, the direction, and the acting come together perfectly to create a wonderfully subtle and elegant narrative about a woman on a search of discovery, yet the understated social commentary that is interwoven organically within it elevates the film even higher. Poetry is, without doubt, a must-see film.